It's been quite an experience seeing the turtles, eels, reef fishes and rays from a whole new perspective in the Tropical Oceans Exhibit (that's what we're calling the penguin exhibit while the birds are relocated during the reconstruction of the Giant Ocean Tank). Now there's a brand new animal to observe, and he's a beauty. 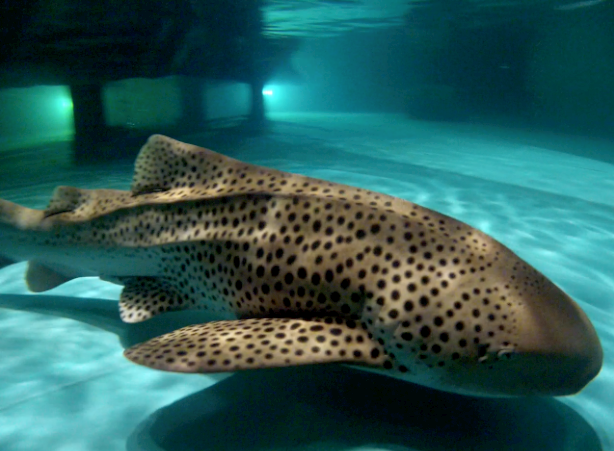 The zebra shark (Stegostoma fasciatum) is easy to spot because of his size and bold spots. This male, named Indo, measures 6 feet long—3 feet of body and 3 feet of tail! That's pretty average for this species, although some have been measured at 9 feet. Indo hails from the Indo-West Pacific region, hence his name. His stout body has ridges on the dorsal, or top, side with yellow-brown spots. The juveniles have stripes more like the species' namesake. 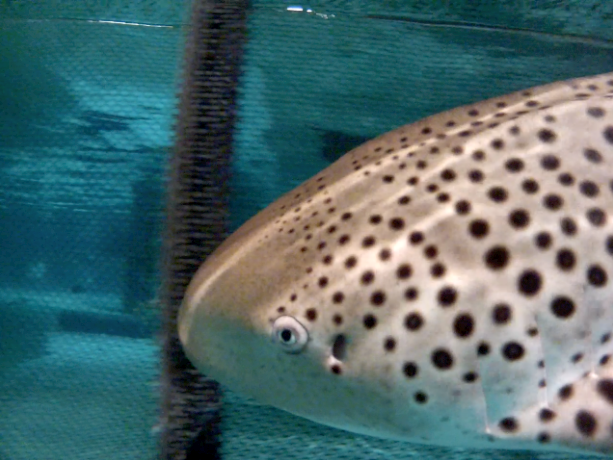 Zebra sharks like to snack on mollusks, small fishes, crabs and shrimps. Here at the Aquarium, he's given a variety of seafoods, including capelin and squid (low calorie offerings) and shrimp (only as a treat or as an enrichment or training item, Indo loves shrimp). He's fed 0.75 pounds three times per week to ensure the animal maintains his handsome physique. 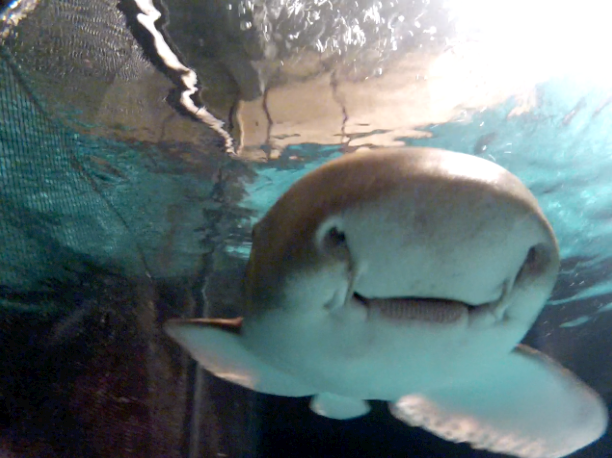 Interestingly, this shark is part of an AZA breeding program, much like the penguins at the Aquarium. Indo was one of the first born to the program at the Shedd Aquarium in Chicago, then lived in Pittsburgh for many years. He has grown up in aquariums and was trained to feed using a target of a yellow circle. The aquarists do this by positioning a pole with the target circle in the water, indicating it’s time for the shark to station. Once the shark sees the circle and touches the target with his nose, he’s rewarded with some tasty morsels. He's smart, he's handsome and Indo is an exciting new addition to the Tropical Oceans Exhibit. Come on by the Aquarium to see this stunning new addition for yourself! Lionfish (Pterois volitans) are quite lovely to watch, with their graceful fin spikes and stark brown and white bands. But don't be fooled, this fish is armed and dangerous! These residents of the Indo-Pacific were accidentally introduced into the Caribbean in the 1990s, and they are causing havoc on native reefs today. That's because lionfish are prolific breeders, have quite the appetite and no natural predators to keep the population in check. This invasive problem is quickly becoming one of the most important conservation issues in the world. 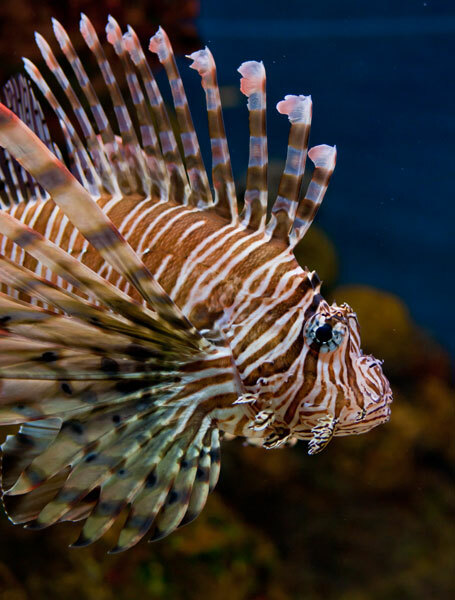 A long-time Aquarium volunteer and avid scuba diver Don Stark talked about the invasion of the lionfish on the Divers Blog. Don has taught many of our teen scuba diving students about this "prickly situation." (More on the students' encounters with lionfish here and here.) In fact, divers on the Bahamas Expeditions have been encountering these nasty predators in greater frequency. They've even sampled lionfish for lunch — turns out, they're quite delicious! Most recently, researchers have spotted lionfish in Belize. Invasive species are a big problem all around the world. In the Phoenix Island Protected Area, rats threaten native bird populations. Comb jellies invaded the Black Sea and have wiped out some commercial fisheries. And today we're seeing lionfish muscle into Caribbean reefs, far from their native habitat. Many visitors want to know where they can find the really big fish. Well, of course there are the tarpon and permits in the Giant Ocean Tank. But any discussion of really big fish at the Aquarium would be entirely incomplete with mentioning the goliath grouper. It's called goliath, after all! 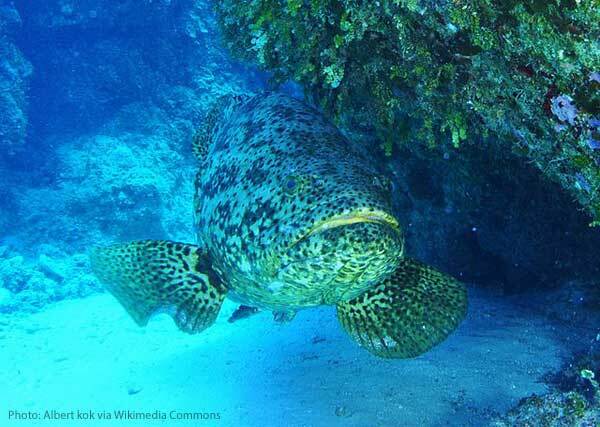 The goliath grouper (Epinephelus itajara) is one of 159 species of groupers living near coral reefs, rocky outcrops and even shipwrecks throughout the tropics. This large species can be found relatively close to home, living along the coast of Florida, through the Caribbean and the Gulf of Mexico, as well as the eastern part of the Atlantic. While many species can reach a few feet in length, the goliath grouper stays true to its name, growing over 8 feet long and 800 pounds during its 40 year lifespan. This makes it the largest grouper in the Atlantic! Though the Aquarium’s groupers are not nearly 800 pounds, they are still pretty impressive to look at. They seem even bigger once you see them in their Thinking Gallery home. 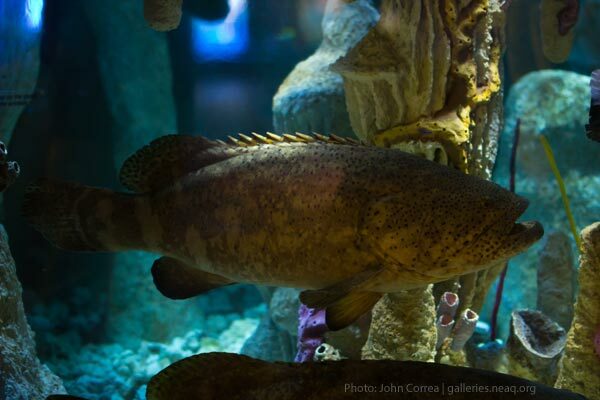 Our goliath groupers can be found in the Blue Hole exhibit, located on the second floor of the Aquarium. Blue holes are cave formations that were once above water but were submerged over time. Though blue holes can be small and cramped, these solitary groupers love to live in these cozy, underwater caves and crevices. Known to be thigmotactic, groupers like to be in contact with a surface or an object around them and the tight quarters of the blue hole allows them to be in touch with the walls or other structures of the underwater caves. In addition to being cozy, blue holes are a great spot to sit and ambush prey like spiny lobsters, shrimp, fish, octopus and young sea turtles. Since groupers don’t move around much, these holes provide a great home range where groupers spend most of their time, even protecting their territory by making an audible rumbling sound to warn other animals to keep away. 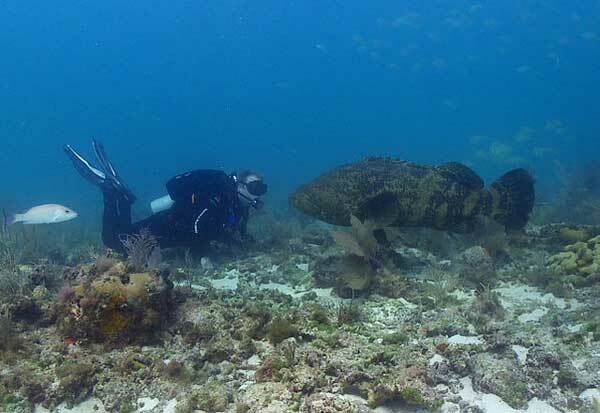 Our researchers have spotted goliath groupers in the wild in Belize! Did you know they can change from female to male during the course of their lifetime? Have you watched a neon goby clean their skin and mouth? Keep reading about these behemoths of the oceans and other residents of the Aquarium and our blue planet. The giant Pacific octopus is one animal at the New England Aquarium that most everyone wants to see. Perhaps it's their keen intelligence or their camouflaging abilities. Or maybe you heard about a special event like when Octavia laid eggs, or when Truman squeezed himself into a box. 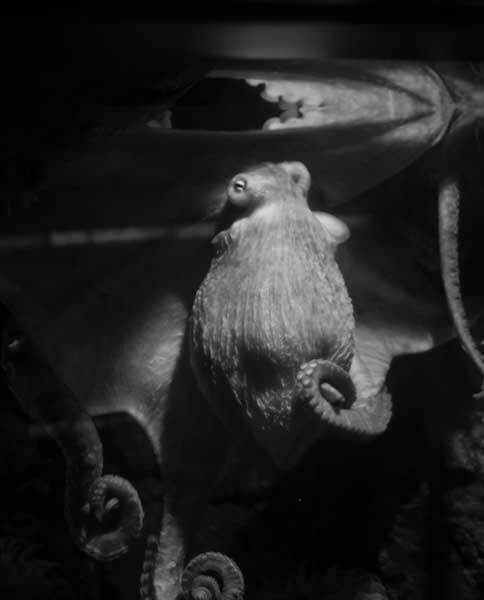 Or maybe you heard the Aquarium tale about the octopus that sneaked into another tank behind the scenes to snack on fish. Listen to aquariust Bill Murphy tell the tale here while interacting with George. 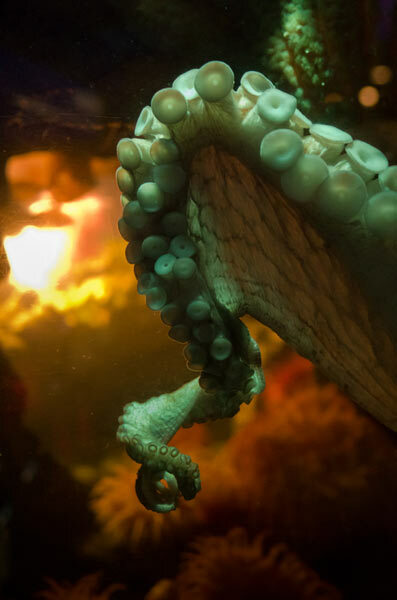 There's so much to learn about these fascinating cephalopods, and it's even more fun to see them in person! 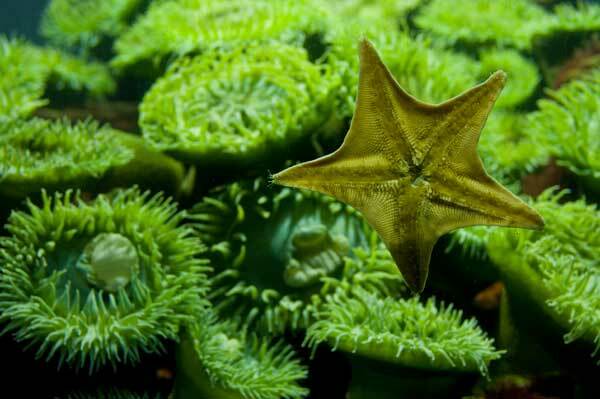 Stop by one of these days and get to know one of the most fascinating animals at the Aquarium. 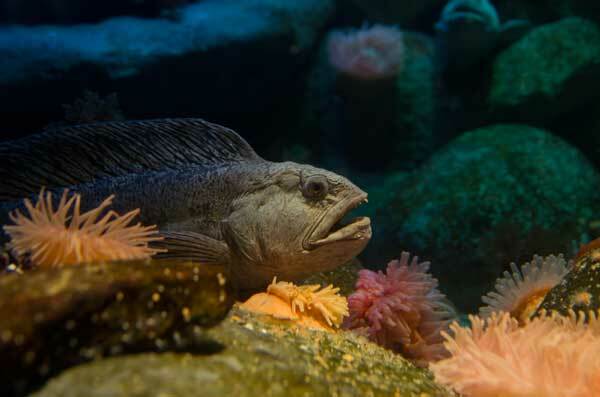 In the dark corners of the Boulder Reef exhibit is a fish with quite a toothy grin. 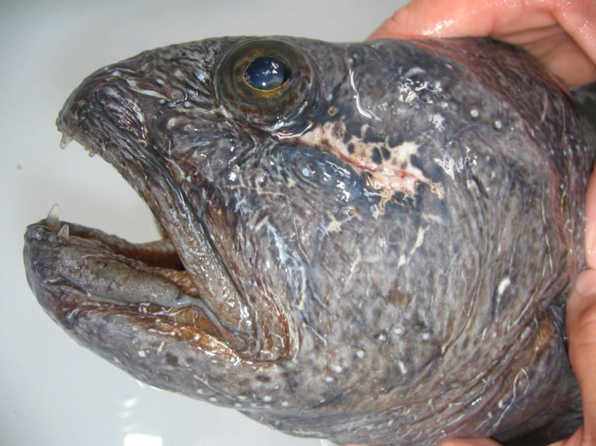 It's the wolffish (Anarhichas lupus)! Wolffish are elongated fish may a face that only a mother could love, with a set of snaggleteeth that are replaced every year. But they are fascinating creatures. 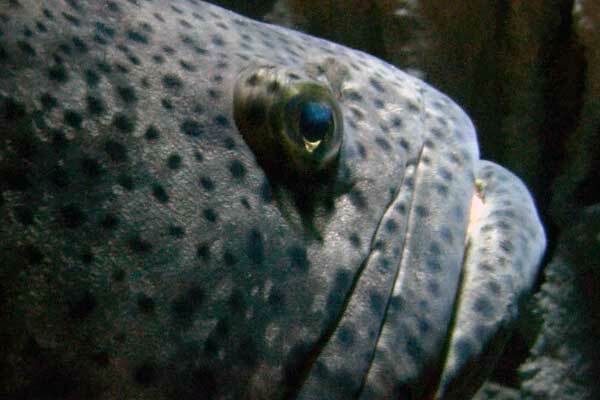 In 2011, several young Aquarium scientists traveled to the Montreal Biodome to study two species of wolffish: Atlantic wolffish and spotted wolffish. They were studying how the fish respond to stress, as one fish guest blogged about in this post (wink! ), by sampling a tiny bit of the fish's blood. Read about the intern and graduate students' experience here. Those teeth are sharp! An Atlantic wolffish bears battle scars from aggressive tank-mates at the Montreal Biodome. As gnarled and grizzly as they may look, they are commercially relevant for their eggs (caviar) and meat. Consider how your seafood choices can help the oceans. Visit www.neaq.org/seafood. Look beyond the dinner plate. 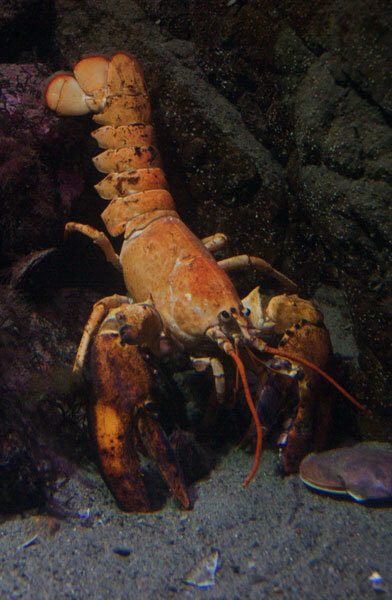 You can find New England's favorite crustacean in the Gulf of Maine exhibit at the New England Aquarium! Aquarium educators have a lot to share about these bottom feeders. 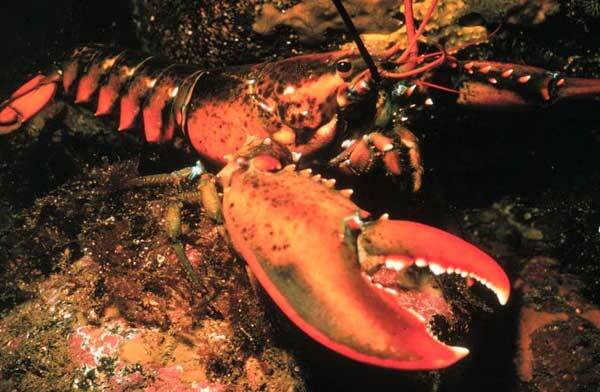 For example, have you ever noticed that a lobster's claw are two different sizes and shapes? The thicker claw with rounded nubs on the cutting edge is called a crusher claw, used for crushing hard-shelled foods. The other is called the cutter claw. Thinner and pointier, it's used for gripping and ripping. 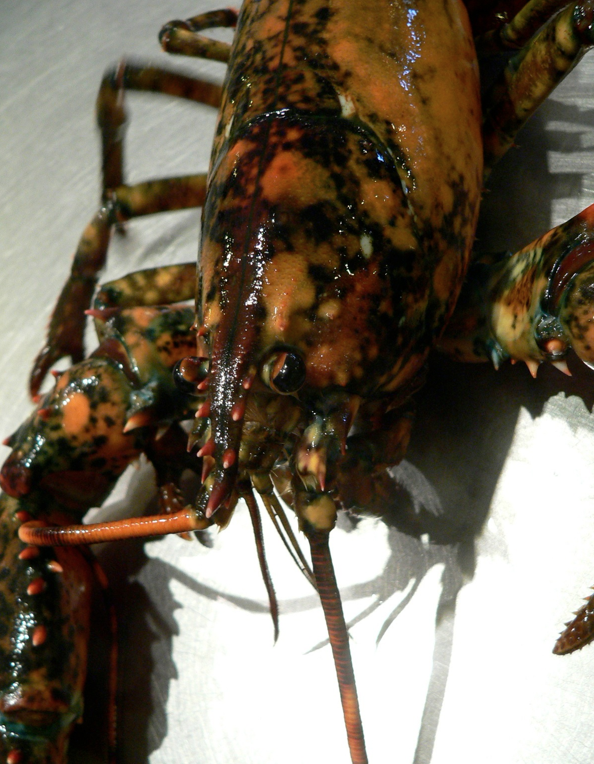 The blogs are also bursting with cool lobster facts and stories. Learn about the many colors in the lobster shell palette. Get a good look at one the heftier lobster to have called the Aquarium home. Meet one of the lobsters that greets visitors during live animal presentations. Even learn how lobsters in the wild communicate with each other (you'll never guess!). Aquarium scientists recently made news with a story about lobster shell disease research. Learn more about the Aquarium shell disease research program. In addition to shell disease, researchers in the Aquarium's lobster lab are also looking into lobster nutrition, brain development and shell colors. These amazing animals have long captured our interest and our taste buds. 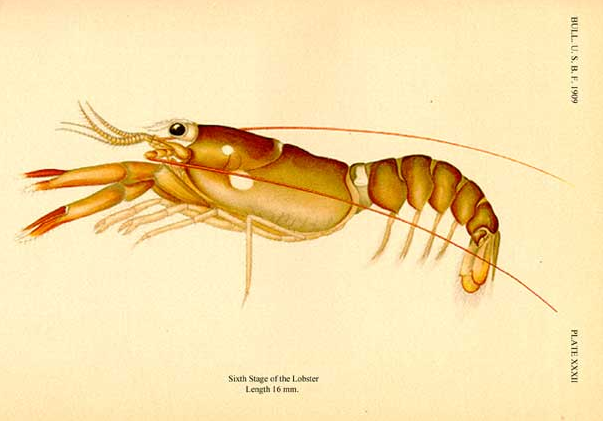 Find historical drawings from the late 1800's (like the one above) of lobsters in different stages of development. Learn about the long, bumpy history of lobster hatcheries in New England and around the world, and learn how the robust commercial fishery began. Communication across the animal kingdom is a seldom understood phenomenon (our right whale researchers are looking whale communication right now). While we know that most animals need to communicate with others of their species for various tasks, such as territorial dominance or mating practices, the exact processes are often still a mystery. In the case of lobsters, however, our understanding of their communication processes has increased significantly in recent years. So, how do these animals “talk” to each other? Well, to put it as simply as possible, they pee in each others' faces. When lobsters urinate they are also releasing pheromones (or chemical smells) at the same time. There are a number of mysteries still involved in the production and dispersal of these pheromones, though. What is currently the most accepted theory involves nephropore rosette glands. 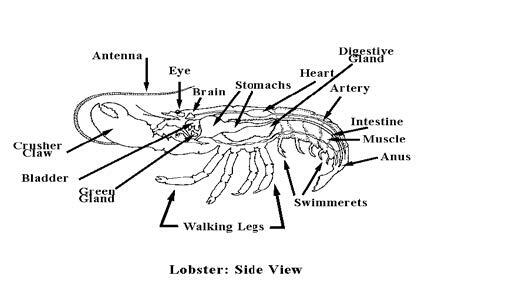 In looking at the diagram below, you can see the lobster’s bladder is located under the brain. These rosette glands are connected to the urinary tract, so they can produce pheromones and then introduce them into the urine stream. American lobsters (Homarus americanus) release this urine from nephropores at the base of their large antennae (that’s right, lobsters pee out of their heads). Once released this urine is injected into the gill current produced by the lobster and this current projects the urine forward. It has been measured that lobsters can transmit urine signals up to SEVEN BODY LENGTHS ahead of them! That’s some pretty powerful urinary output. Why does a lobster pee out of its head? 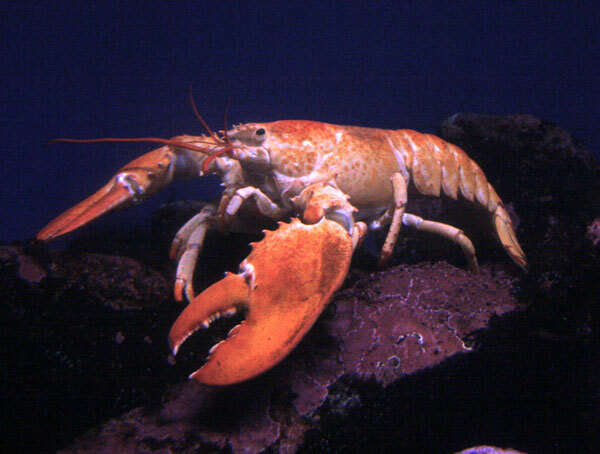 A lobster’s claws, which are used for capturing prey and for defense, are located at the front of their body. Due to this, a lobster enters its shelter backwards so that its first and best line of defense is facing the main entrance to its home. Since it faces the opening of the cave, peeing out of their heads is the most direct route for the urine to reach the water around them. In general, lobsters don’t really get along. If lobsters come into each others' territories then more often than not they’re going to fight; particularly if the lobsters are both males. They do this in competition for both the best shelters and for preferential mating rights. So where does pee come in? Well, once a dominant male has been determined he has to let any females know that he’s stronger. Since they probably didn’t see the fight something about the lobster needs to be different. The thing that seems to be different is the smell of their urine. What is actually different in their urine isn’t entirely understood, but it is thought because he is “happy” that he won he may produce more serotonin which then changes the scent of his urine. As discussed previously, the dominant male in the area has a more attractive scent and the females actually come to him. The females approach the male’s burrow and proceed to pee in his face. That reduces his aggression and allows the female to enter his home. The female is allowed to remain in his burrow for up to two weeks before she must leave, allowing the next female in the area a chance to also mate with the dominant male. During this period of cohabitation the female’s urine is sending signals to other females that the male has coupled up. You can look for American lobsters in the Aquarium's Gulf of Maine exhibit. 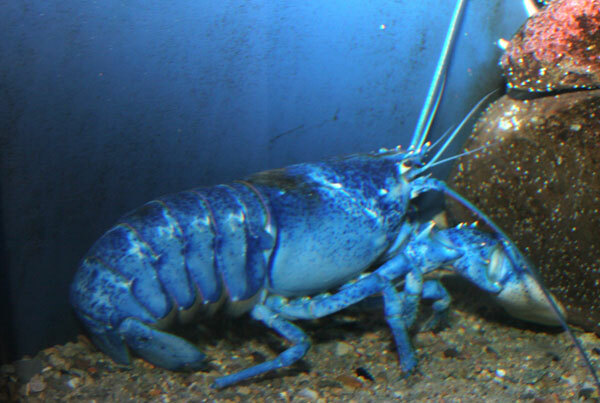 You're likely to find lobsters of different colors, like blue and calico, although this cast of characters is always changing. There's even a hulking 21-pound lobster at the Aquarium! Meet a lobster up close during a Live Animal Presentation, the educator can probably answer you questions about the Aquarium's important research on lobster shell disease. Hang on, it's the green sea anemone! 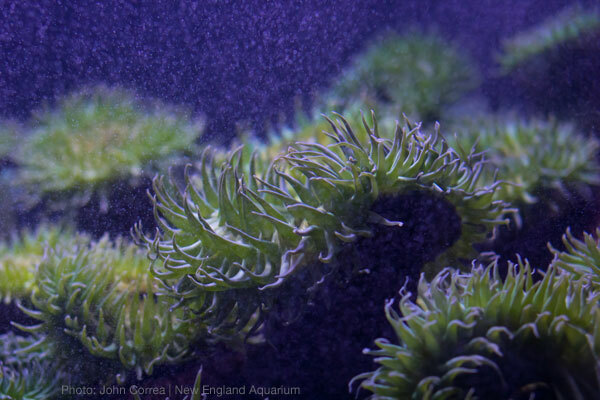 The green sea anemone may not be one of the most charismatic ocean animals. Of course, it doesn't play with garden hoses for fun like our young sea lions, and it doesn't put on shows for right whale researchers like that calf in the Bay of Fundy. But its vibrant colors and feats of strength make this tidepool resident worthy of a closer look! As you can see, the anemones are well-adapted to living in the waves. Waves crush, abrade, and scour. In spite of this, plants and animals have developed special, often ingenious ways of coping. Sea anemones form attachments with a smooth, muscular disk on which they can slide very slowly. They can survive short periods of low tide exposure to the air by retracting their body and tentacles into a round, water-retaining mass. 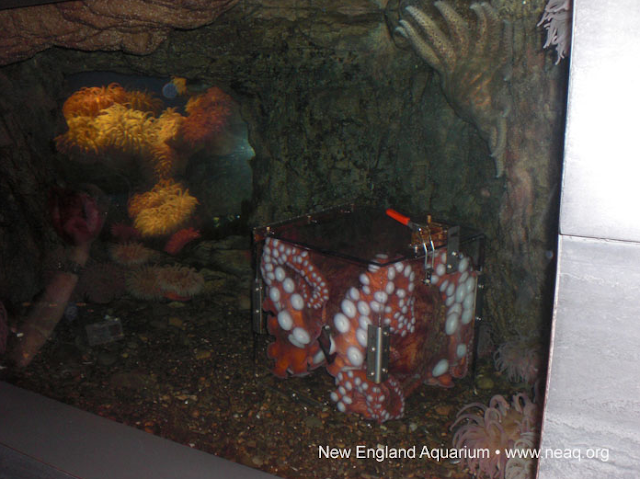 The animals in this exhibit hail from the Pacific northwest, like its giant Pacific octopus neighbor. The water is cold and rich with nutrients. You may also find sea stars, kelp, urchins and a few hardy fish in tidepools like this. In the wild, the abundant food supply in these tidepools and adjacent kelp forests also attracts sea otters and seals. Compare the animals in this tidepool with those that you would find in tidepools around New England. Around here you might find rockweed instead of kelps, more mussels and crabs, smaller fish and fewer anemones and urchins. Come by sometime to see for yourself! There's a lot more to goliath group than mere size. Groupers have a very interesting change in lifestyle: As they get older, they change from being a female to a male! 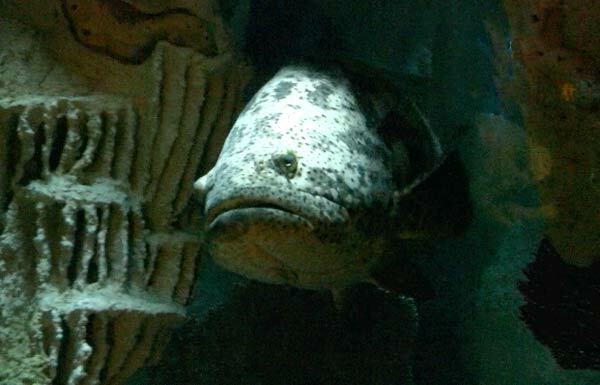 As groupers grow, they are first female when they reach sexual maturity. After a few years, the female will transform into a male. Scientists believe that this transformation is triggered when the grouper is the right age, they are in a group of animals that are about to spawn and there are fewer males in the population. Once this change happens, it’s permanent. What’s the advantage of having this life cycle? The energy-consuming task of growing eggs is left to the younger fish that are healthy and strong while the larger fish that have proven their ability to survive can fertilize the eggs as males. It's a good way to keep populations strong through genetics! Groupers gather together in spawning groups once they are ready to mate. These groups vary in number, size, and location. Once together, the females lay eggs that float to the surface after being fertilized. The eggs then float with ocean currents for 40 to 60 days and arrive at the nursery grounds just as the tiny groupers hatch out. These small groupers swim down to the bottom of the ocean and hide in sea grasses and mangroves until they get larger, remaining in the nursery area for 4 to 6 years. Once they are large enough, the groupers then leave the nursery area and then move offshore to join adult populations in coral reefs. 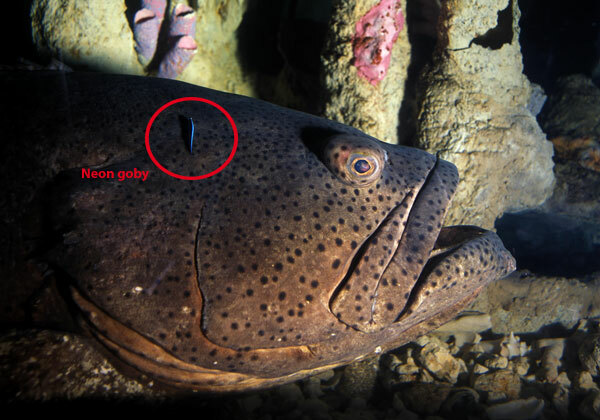 Take a closer look: Visitors can watch neon gobies cleaning the groupers in this video. Watch the groupers in the Blue Hole exhibit and you may see them getting a bath! Groupers rely on small cleaner fish to stay free of parasites and other itchy conditions. The small one-inch neon goby (look for the small black and neon blue stripes) is the fish for the job, removing loose scales and parasites from the skin and gills of the groupers. The groupers get clean while the gobies get a snack and protection. Groupers are the dominant, top-level predatory fish on many coral reefs and help maintain balance among fish populations and increase the biodiversity in an area. However, these groupers face many challenges, including the destruction of mangrove nursery habitats and increased human activity along coastlines. The chief concern for the goliath grouper? Overfishing. These fish are caught as food but is hugely impacted by overfishing because of their reproductive behavior: when they gather in the mating groups, fishermen remove the largest groupers from the population. As groupers reproduce slowly, this practice leads to rapid decline. It’s estimated that the species has declined by 80% in just 40 years, causing them to be considered a critically endangered species. Though there are regulations in the USA, Caribbean and Brazil prohibiting fishing, particularly in areas of marine preserve areas which offer protection for groupers during their mating season, there is still concern that fishing and poaching in other areas continues, making the future of the goliath grouper uncertain.